My first gift from my MIL was an earthenware pot which she gave me when I visited them after my marriage. She had bought it from the sandhai (souks) and I thank her whenever I use it. I just ccall it as Keerai Chatti nad it came along with a big wooden mathu to make the mashing process quite easy. The inner side is embedded with very small smooth pebbles with rough sand in between. It not only mashes keerai but also to mash other veggies. 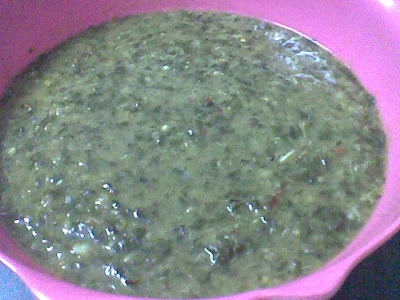 Here goes the keerai masiyal I made with its help. Clean and wash the amaranthus leaves. No need to chop the leaves. Soak the shallots in some water and peel the skin. Wash the dal well. In a cooker place the keerai along with the washed dal, shallots, chopped tomatoes, green chilli. Garlic, Turmeric powder and salt. Pour water till they are covered. Cook for two whistles and open after letting the steam out. Transfer it to the keerai chatti. In a kadai heat the oil. Add cumin seeds, asafetida and wait till it splutters now add the whole red chiilies, and the coriander seeds and fry till the coriander turns to a dark brown color. Transfer it to the keerai and mash it well with the mathu or any wooden ladle while it is still hot. Adjust the salt. Keerai masiyal is ready and it tastes absolutely great with Vatha Kulambu and Mor kulambu. You can also use siru keerai or arai keerai instead of mulai keerai for this dish. This is off to food in colours with the theme green for this month hosted by Sunshine Mom. Diet foods hosted by Divya. wow, this looks so delicious and colorful. I love masiyal too. This is different than the way I make it – has to taste delicious. I like the idea of using a chatti – thanks for sending it to FIC. Thanks for sending this for the event Radhika..So sweet of your MIL to present it to u..